It's not living up to the hype. Unhappy Amazon shoppers vented on Wednesday about its "Prime Day" sales, slamming the online retailer with the hashtags that included: #unhappyPrimeDay, #AmazonFail, #gobacktosleep, and #PrimeDayFail. Amazon (AMZN) had promoted the 24-hour sale event as having "more deals than Black Friday" and teased major savings on electronics, home appliances and baby products. But based on the response on social media, the site's "Lightning Deals" weren't that electric and some products sold out in a matter of seconds. Addressing complaints on social media Wednesday morning that desired products were not being discounted, Amazon said, "We have years of experience with these types of events and we stagger the deals to make sure the fun will last through tonight." "Prime Day has been exciting so far," Amazon told CNNMoney in a statement. "We strive to have Earth's largest selection so deals range across all 40 product categories including back-to-school supplies, outdoor items, fashion, beauty and even things to stock-up your cupboards." Later Wednesday, Amazon said that, by at least one measure, "Prime Day" had surpassed last year's Black Friday. 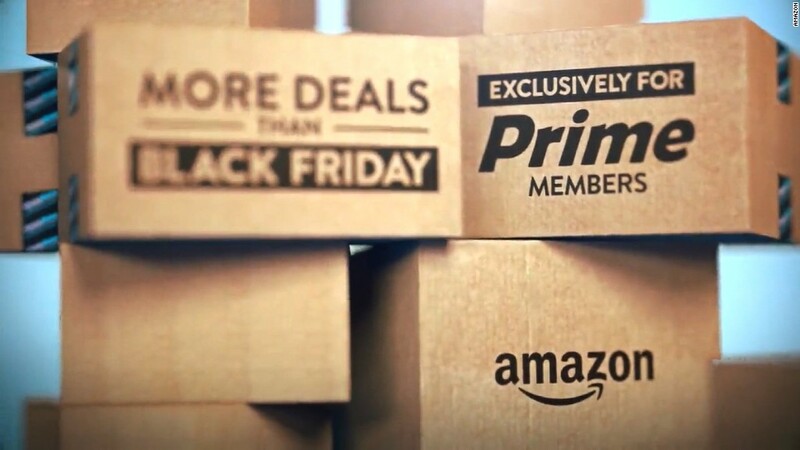 "Prime Day peak order rates have already surpassed 2014 Black Friday," Amazon told CNNMoney, using a term that the company said refers to the speed with which customers are ordering once they enter the site. One customer on Twitter took issue with Amazon's claim that Prime Day would be bigger than Black Friday, saying it was more like April Fool's Day. Another frustrated shopper user said the sale items sold out in seconds -- even "a bunch of crap that no one wants..."
Some were perplexed that even items like "sharpies" were gone in a flash, with one person using the hashtag "amazonsucks." The backlash was captured by one shopper who tweeted: "Now whenever something in my life goes wrong or I have a bad day, I'll say I had a #primeday." Now whenever something in my life goes wrong or I have a bad day, I'll say I had a #primeday. "Jamal" took to Twitter to call it a "horrible sale with misleading promotion. Where's the stuff we want?" Ridiculously disappointed with #AmazonPrimeDay. Everything is either sold out or junk that no one wants. Way to thank your #prime customers! Another user tweeted, "When I die I want whoever's responsible for #AmazonPrimeDay to lower me into my grave so they can let me down one last time." Tried to check out #AmazonPrimeDay -- what a confusing mess! Anyone find anything interesting? So what I'm getting out of this is that #PrimeDay is some sort of postmodern experiment to see if disappointment can be quantified. And "Teressa" went so far as to say the tweets generated by customers were better than the actual deals. #PrimeDay tweets are better than actual PrimeDay. An executive with the Market Track firm told CNNMoney that while "Prime Day" had comparable deals to Black Friday, Amazon hadn't included some of its best-selling items in the sale. "Although the best Prime Day deals rivaled the best Black Friday deals, Amazon has not included their most in-demand products in their Prime Day event," Vice President of Marketing Traci Gregorski said. "Just under 10% of their best-sellers in high-demand categories like tablets, televisions, toys & games, video games, laptops, digital cameras, and movies/tv shows were included in the event." Walmart (WMT), which also hosted a mega-sale on Wednesday, didn't seem to be experiencing quite the same blowback as Amazon on social media from shoppers.